There is no constant but change … the adage even applies to waterfront property as boomers and millennials think city more than solitude. This story is featured in the April 2018 issue of Traverse, Northern Michigan’s Magazine. Get your copy! In fact, wherever you are here in the water wonderland, you are never more than six miles from a lake. It’s clear the Great Lakes State truly is the state of great lakes. For many people, the closer to the water, the better. There’s nothing like walking out the door and strolling down to the lake. Whether people prefer a morning swim, an afternoon on the boat or an evening riverfront bonfire, waterfront property has historically been among the most desirable places for a home or cottage. That has always been one of the draws to Northwestern Lower Michigan. As summer vacationers and retirees began flocking to the region in the 1970s and ’80s, waterfront property values began to escalate. That continued through the ’90s and into the new millennium, but the ever-rising prices were brought to a screeching halt by the Great Recession. It devastated the housing and construction industries, as well as the auto industry, which, of course, drives much of the state’s income. That economic storm caused home values—even waterfront home values—to plummet, and sales in the region dropped like a rock. But economic recovery over the past eight years has propelled home prices to match and occasionally surpass their historic highs. So are there homes available on the water? Always. Are they affordable? That depends. The recession saw home prices tumble, and no segment was hit harder than waterfront. But that was then—2007 to 2010, to be exact—and this is now. Waterfront values are on the rise again, and in some markets, waterfront homes in cities and towns are especially in demand. Consider two properties in Leelanau County sold by Perry Pentiuk of Venture Properties. “I sold one on the river in Leland for $1.7 million. It had 100 feet of frontage and 80 feet of depth. This was in town—they wanted to walk to the Bluebird,” he says. On the other hand, he pointed to a waterfront property at nearby Gill’s Pier. “It’s a lovely home with 230 feet of sandy beach. In Leland, you look at the Standard station. This one has a view of Fox and Manitou Islands,” he says. Its asking price? Also $1.7 million. “Eighteen years ago a house on Cathead Bay with 300 feet of property and sunset views of South Fox and the Manitous was $1.2 million. Now it’s on the market for $1.3 million,” Pentiuk says. That demonstrates that for all the ups and downs of the real estate market, some waterfront properties—even in gorgeous and remote areas—haven’t appreciated nearly as much as you might have suspected over the years. From Manistee to Harbor Springs, waterfront homes where residents can walk to shops, churches and restaurants are among the most prized properties. “There’s a lot of downtown enthusiasm,” one Realtor said. Whether that downtown is Leland or Manistee, Traverse City or Harbor Springs doesn’t seem to matter. Brown and his company represent properties all across the region. As the company name indicates, the firm concentrates on waterfront properties—68 percent of sales are waterfront, a much higher figure than that of most companies. Like Pentiuk, Brown also sees a growing preference for downtown living and believes part of the trend away from remote waterfront properties has to do with the graying of the Baby Boomers. For many of those people, owning a cottage Up North was a chance to leave their worries behind. A decade ago, they were buying cottages for occasional visits, but now they look to live here for extended periods and want the amenities of a town nearby. “A ton are selling cottages in rural areas to move to Traverse City,” Brown says. Compared to their parents, the Boomers’ children (the Millennials) are spending their money differently in the early parts of adulthood. Their lifestyle is less about getting away from it all and more about having nearby access to it all—starting out in the urban areas where their parents are ending up. “The next generation of buyers lives a different life,” Brown says. Among the differences: They put more into their primary homes and often drive newer cars, plus their kids are often into sports or activities that demand more time. And even if Millennials want to get away from it all, they do it differently. Their dreams have changed—they’d rather go on an exotic vacation than visit a rural cottage, Brown says. Northwest Michigan’s waterfront story, however, changes based on where you happen to be. Suzanne Riley of Century 21 Boardwalk in Manistee believes all of Manistee County is on the verge of a really good year for waterfront sales. “I think 2018 will be a good time to buy,” Riley says. “It’s the opposite of the stock market. You want to buy high and sell low,” she says. She’s referring not to prices, but water levels. When water levels are high—as they are now—is when the prices are lowest. Selling when the waters recede enables buyers to see more beachfront, and thus properties command a higher price. She sees the entire Manistee County area as being in what she calls “a weird vortex,” from a geographic perspective. 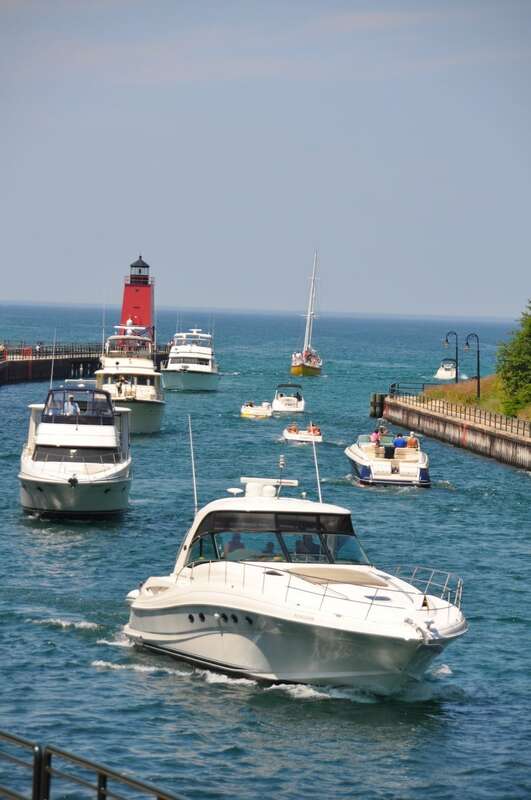 Buyers from Chicago to Kalamazoo go as far north as Ludington, while those from the Detroit area and the east side of the state in general will head north to M-115 and go west, ending up on the Lake Michigan coast at Frankfort or points north from there. That leaves waterfront communities like Arcadia, Onekama, Bear Lake and Manistee with notably less visibility. That’s despite the fact Manistee proper boasts amenities including an airport, a hospital, beaches, restaurants, and even a casino, and nearby you can find inland lakes and rivers, plus skiing and golfing at places like Crystal Mountain and Caberfae. Riley points to properties on Bear Lake and Portage Lake as desirable and affordable. “I’ve got a condo on Portage Lake for $198,500. I can’t believe it’s still here,” she says. Riley remains bullish on Manistee. Parties from downstate are investing in properties and proposing developments, seeing a chance to get in on the ground floor as property values are slightly lower than neighboring lakeshore communities. That translates to a similar optimism on waterfront properties nearby. “I expect 2018 to be a great time to invest on Lake Michigan,” Riley says. For those looking to purchase waterfront property, the quality of the water is of paramount importance. Deep Caribbean blues start in Lake Michigan around Ludington and continue north past Manistee, Empire and Leland, all the way to Charlevoix, Petoskey and Harbor Springs, before meeting up with Lake Huron at Mackinaw City. The quality of inland lakes varies more widely. And that’s true not only of the water, but also of the lake bottom and beach. “Torch Lake, Elk Lake, Glen Lake are super sand. Spider Lake and Forest Lake are silt. People want sandy frontage, not silt or rocks,” Brown says. To Brown’s list of most desirable lakes, Pentiuk would add Crystal Lake and North Lake Leelanau. He sees Little Glen Lake and South Lake Leelanau as a step below, and Lime, Little Traverse and Silver Lakes as examples of a third tier. A lake’s cachet is naturally reflected in the price of its homes. Torch Lake has long been coveted by buyers. Walloon Lake is similarly pricey. Blachy considers Walloon to be the best in the state, though sometimes the homes can be priced right out of the market. He sold a lot on Walloon for a million dollars. The buyer built a home with 10 bedrooms and 10 bathrooms. “That’s too big” to easily sell, much less to get their money back, Blachy says. Pentiuk works mostly with properties in and around Traverse City and Leelanau County. He says that where properties are for sale there will be plenty of activity. He suspects this will be another good year for waterfront property sales, though he hesitated to say whether it would favor buyers or sellers.